Advanced Natural Skills/Abilities: Their sense of smell is 50% better than that of a human. Monkey/Ape Boys can also leap 4 feet high and 8 feet across (increase lengthwise leaps by 20% with a running or swinging start); can run, leap, and swing through trees at half their normal running speed. They are also double jointed. Prehensile Feet: Can use their feet to assist in climbing, holding objects, and even using simple hand tools and weapons (using a gun is possible, but penalties are applied); some skilled apes/monkeys can even write with their feet (though not as legibly as with their hands; this character is one of those who can). Nuero Mace: Can be used to parry M.D. attacks (even borgs or power armour.) Stored in apartment. Saving Throw: 16, success results in loss of initiative and one attack but is otherwise fine. Wilk’s 320 LASER Pistol: Stored in apartment. Payload: 20 individual shots. ×4 extra e-clip. Bonus: +2 to strike using aimed shot due to the lightweight nature and superior balance of the gun. Wilk’s 447 LASER Rifle: Stored in auto shop. Payload: 20 per e-clip, cannot use long e-clip (×4 extra e-clips). Improved Hunstman Armour: Increased M.D.C. capacity, lighter weight, and better mobility from expensive modifications. Stored in apartment. M.D.C. By Location: Main Body: 46. Head: 36. Arms (2): 16 each. Legs (2): 26 each. Improved Wastelander Motorcycle: Increased M.D.C. capacity, lighter weight, and better mobility from expensive modifications. Parked in auto shop. Crew: 1 plus driver, and a large storage compartment. M.D.C. By Location: Main Body: 66. Tires (3): 3 each. Black Market Items: 25,000 credits worth of complex tech and modified weapons hidden away in his shop/home. Other Currency/Accounts: As the owner of the “Monkey Wrench” (an automotives/repair shop), he has his own furnished apartment above the shop (where he and his Sister live) and savings from that business (15,000-30,000 credits per month, depending upon business traffic, though much of it goes back into the company or toward rehoming fugitive D-Bees). Not applicable; though they are not opposed to augmentation to save life or limb, or even to serve a useful purpose. Description: Looks exactly like a Silverback Gorilla, except he stands straighter (and is thus taller) like a human would, due to genetic modification (he retains the rotundness of a gorilla, though). Speech is fully human, but may still growl or howl in excitement or anger. Most often wearing coveralls (complete with oil stains and a name patch), or casual clothing (tshirt and overalls or jeans with suspenders and a ratty baseball cap); hardly ever wears armour (considers himself a bit of a pacifist) and detests “monkey suit” formal attire. Also not typically carrying his weapons, he utilizes his tools (hammer, wrench, etc.) as weapons if he has to, as he always has them in his toolbelt or nearby. Insanity(s): Phobia: Swimming/Large Bodies of Water (includes riding on a boat and crossing strong/large rivers). Sentiments Toward Coalition State: Wary; since his “escape”, he knows that he could be killed on sight or possibly even hunted down. Avoids areas with CS presence and maintains that he is a D-Bee, not a mutant, for safety. Sentiments Toward D-Bees: Friendliness; believing them deserving of equality, he will come to their defense in tense situations, even going above and beyond to help them. Sentiments Toward Humans: Friendliness; unless the town is human only or obviously pro-CS, he bears no ill will or wariness toward most humans. Sentiments Toward Magic/Psionics: Indifferent; they have their uses, especially the technology based spells, but not being a psychic or caster himself, he doesn’t care much either way. Mutations: None, besides being a genetically altered mutant, himself. Low Physical Beauty Face is so scarred, deformed, frightening or ugly by Human standards that the character suffers penalties of -5% to skills like Gambling, Intelligence (Gathering), Performance, Public Speaking, and Undercover Ops, -20% to the Seduction skill, and a +5% bonus to the Interrogation skill. Any penalties are included in the total percentage in the skills sections. Allergy: Bananas (Moderate): This character is moderately allergic to bananas and suffers the following applicable penalties/afflictions when exposed to it: Itching/painful rash for 3D4 days at contact site, moderate swelling and sensitivity for 1D4 days, painful vomiting (if ingested) until purged completely, and/or fatigue and weakness (-10% all skills and combat bonuses at half) for 1D4 days. Background: A genetic mutation created in the Lone Star Genetics Complex (LSGC), Bram was a secret experiment with the intent to create a gorilla mutant with the intellect of a chimpanzee Monkey Tech. The experiment was successful, and was considered for further exploration as gorillas tend to be more docile and tolerant than chimpanzees, thus easier to control (so long as they are closely monitored and unable to use their strength against their handlers). Before the secret project came to light, however, Desmond Bradford (a high level Administrator of the LSGC) wanted to observe how easily controlled an “Ape Tech” would be in a less restrictive environment. So Bram was released in a mid sized town with basic gear and only a couple of handlers (the rest of the team watching at a distance). The first week of the experiment went well; Bram had peaceful interactions with his handlers and other humans, obeying commands and observing much about the very different environment he was placed in. By the second week, however, Bram’s curiosity had grown insatiable. He took advantage of a sudden and powerful storm to slip away from his handlers and into the outer city (a very enticing and different place than the inner city in which they’d been staying) alone. Over the next couple of days, the storm continued to worsen and Bram observed the lower classes, avoiding law enforcement more easily along the alleys and seeking shelter where he could hide himself away. The town had been all but shut down by this point, due to flooding and power outages; while this made it simpler for Bram to evade recapture (though he intended to return eventually, without an ID chip in his skin he was harder to locate), navigation was more difficult and he found himself on the outskirts of town, near flooding farms and panicked, poorer families. Bram, who loved helping others, assisted a dairy farm in relocating its livestock to higher ground – an easy feat when he can lift a bull in each arm. During this venture, however, the Ape Boy was too near the swelling river and got swept away by the current. Unable to swim, Bram panicked and eventually blacked out from the rough ride along the rapidly churning waters. Bram awoke while being tended to by a deaf human woman called Marissa DePalo. She was a Rogue Scientist who pulled him from the river and resuscitated his near dead body using her medical knowledge. Marissa had found him washed up outside the town and driven him to her own home, miles outside of the CS territory, fearing not only for his recovery, but also his life as he seemed to be a “feral” mutant or escaped D-Bee. Though Bram held no ill feelings toward the CS at this point, during his recovery (a period of a month or so, as he had broken a limb as well) he would meet others (mainly D-Bees) who were being hunted or had been hurt by their policies and harsh practices. Marissa helped these renegades to escape and heal, finding them resources or ways to safer homes outside of the Coalition’s reach, and so Bram began to as well, and his opinion on his creators grew and darkened. Once Marissa moved on in her work to a new, further distanced town, Bram traveled with her to help (he was often her translator for those who could not read or understand ASL). They had become much like siblings over the course of a year, and Bram enjoyed helping her with her work and utilizing his own technical skills as well. Bram opened his own machining and repair shop (the “Monkey Wrench”) out of their new apartment and garage, taking on an identity as a D-Bee dedicated to his trade and the assistance of other misplaced D-Bees. Over the next five years, his business and trade skills improved and expanded, soon he and Marissa were veritable pillars of the community; their secret work helping fugitive D-Bees expanded as well. Family Tree: Genetically designed by one Gloria Calaghan (with approval by Desmond Bradford), Bram doesn’t technically have family. Any other test subjects he may have shared blood with either did not survive or he was not made aware of them in the first place. Bram considers Marissa DePalo, the Rogue Scientist who resuscitated him after his escape, to be an elder Sister of sorts. Marissa and Bram have a very close relationship and he contacts her frequently when either is traveling (through video chat or in written form as she is deaf), they also share a home. Arms: Improved Huntsman Armour: 166 M.D.C. Wilk’s 447 LASER Rifle: 3D6 M.D., 2000ft. Wilk’s 320 LASER Pistol: 1D6 M.D., 1000ft, +2 aimed shot. Nuero Mace: 2D4, chance of stunning. Hammer: 2D6. Wrench: 2D6. Vibro-Knife: 1D6 M.D. Abilities: Prehensile feet, great leaping abilities, and can swing through trees at half normal running Spd. Any image or information provided pertaining to Rifts is the sole property of Palladium Books and any authors or artists therein. I claim no ownership of content, nor do I claim ownership of any borrowed fan-made creations as may be sourced above. Any homebrew creations are not official material, and are merely intended as creative supplementation. 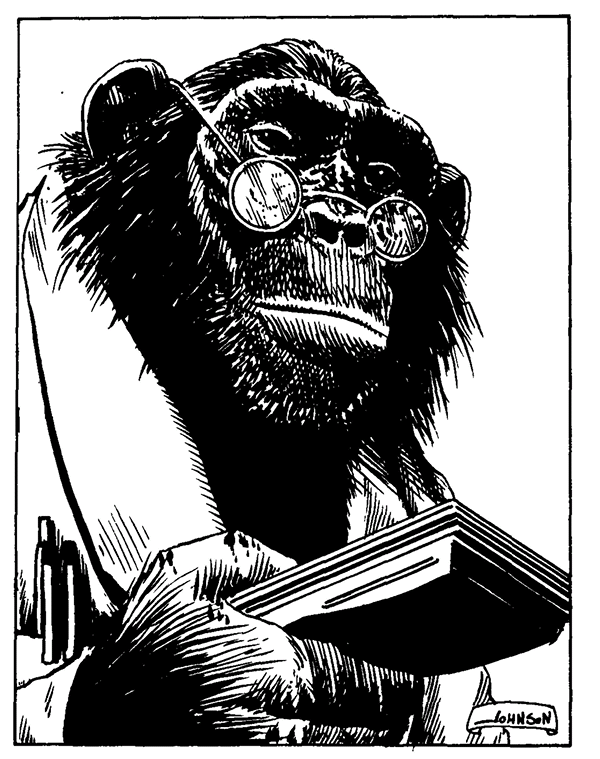 This entry was posted in Character Creation, High Level, RIFTS RPG, Role Playing, Toon Tuesday and tagged ape boy rcc, gorilla mutant character, monkey boy rcc, monkey boy tech, Palladium Rifts, Rifts characters, Rifts pregens, toon tuesday. Bookmark the permalink.